Bolsaplast Shop manufactures bags since 1962. 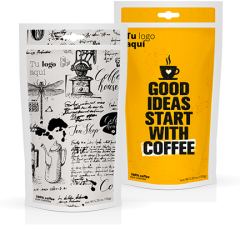 Located in Sabadell (Barcelona), produces both standard bags and also customized bags for packing and promotion of products like coffee, tea, dried food, detergents, linen, etc. When customer needs a packaging in bags (ready-made bags) what company offers is really an advantage, so it is not necessary to purchase huge quantities or carry out a significant investment. During production, all types of materials and systems are used to promote the image and the brand of product inside. It is not only a ready-made bag factory. It offers the product that customer looks for, made with required materials and in the quantities needed. By digitally printing your Doypack bags, you can enjoy fully customized packaging and order in very small batches of just 2,000 bags (without any additional clichés or printing costs). Plus, you can customize your designs or print different formats every 1,500 units. Print all your designs without worrying about the quantities. Choose the type of material, size and finish you prefer knowing that your product will reach the customer perfectly packaged and looking great.